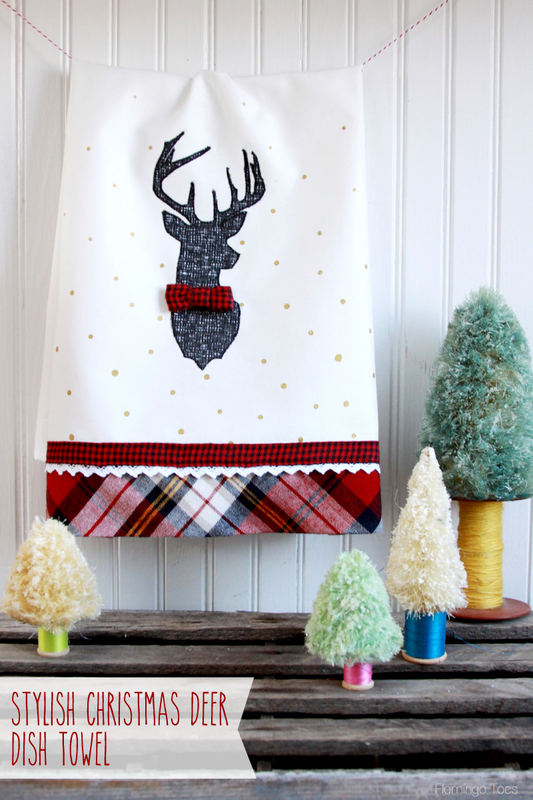 This is so easy to sew up and personalize with your favorite fabric combos! 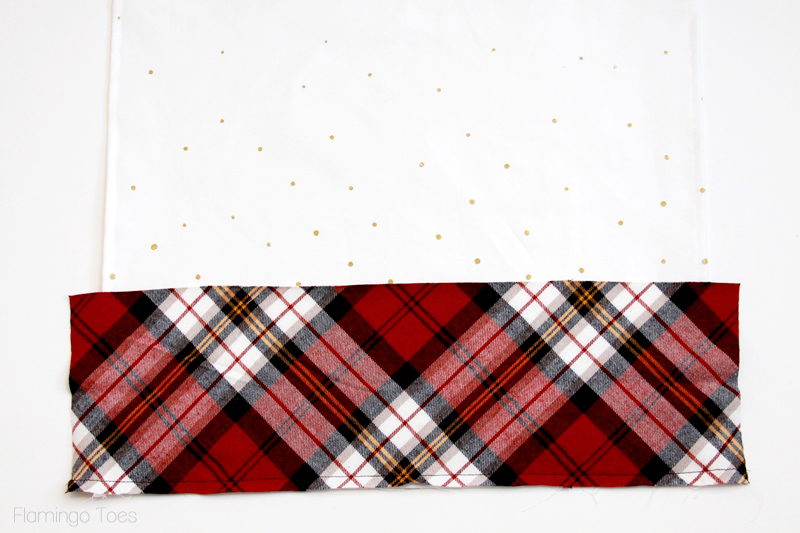 I wanted to make up mine in a sweet assortment of plaids and polkadots but it would look great with florals too! 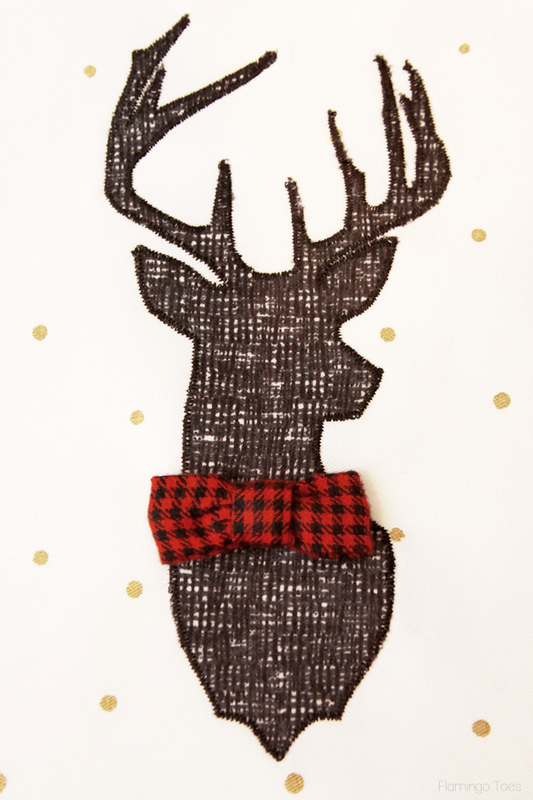 Our deer is so fancy too, all dressed up with a bow tie. 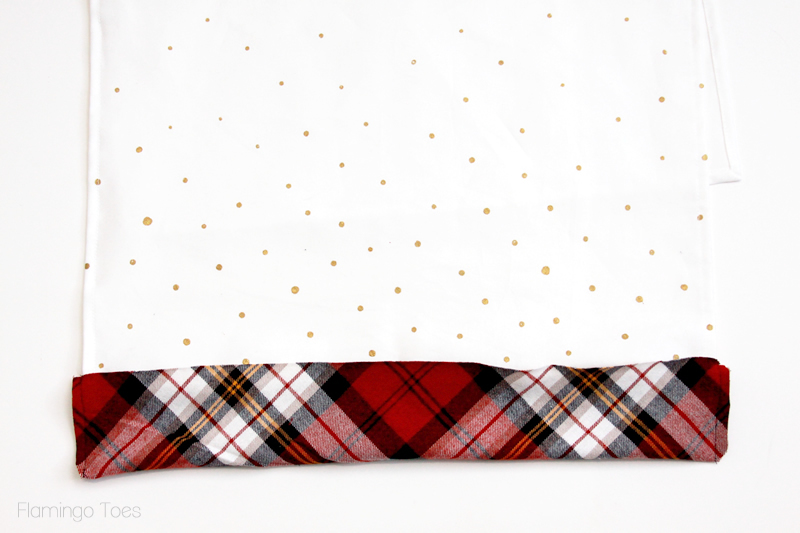 Perfect for Christmas parties don’t you think? 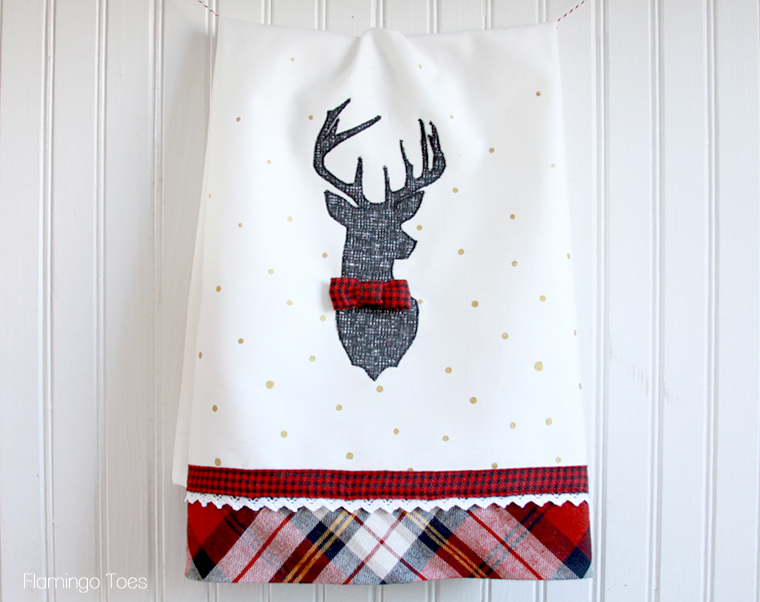 Begin by cutting out your dishtowel. 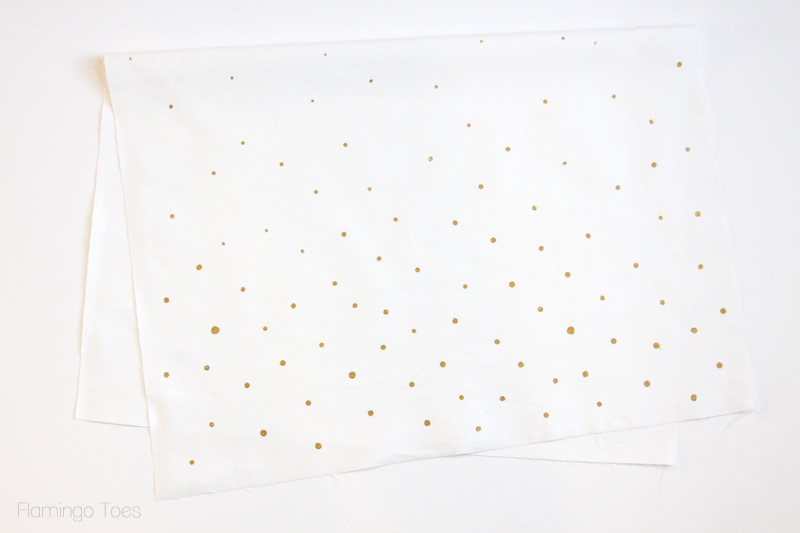 If you want to add the polkadots, add Fabric Medium (so it will be washable) to any craft paint and use the bottom of a paint brush to paint on little dots. I made my dots larger towards the bottom and smaller as they went up to the halfway point on the towel. Once your paint is dry, hem the two long sides and the short end of the towel opposite all your polkadots. Line up your border with the bottom edge of the dish towel so that the right sides are together. 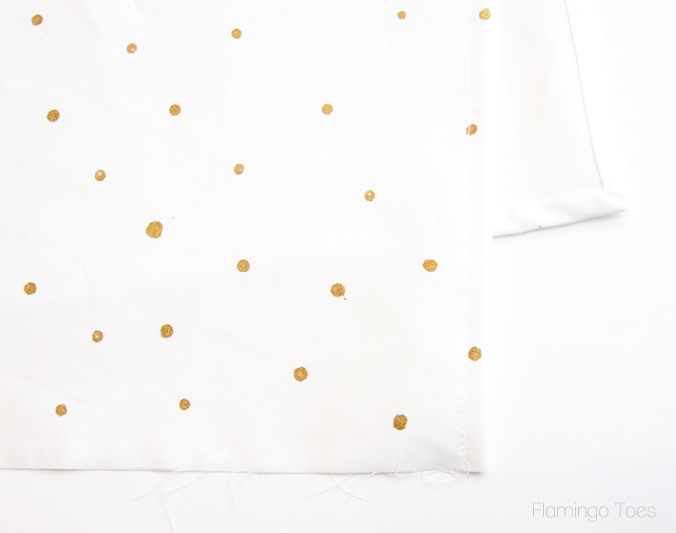 Sew along the bottom with a 1/2″ seam allowance. Press the border down away from the dishtowel, then fold the bottom edge back up towards the towel so the border is folded in half and the front edge lines up with back edge. (see photo below). Sew the two sides of the border so the seams are even with the sides of the dish towel. Trim off the seams and the corners. Turn the border right side out. Press the top edge under 1/2″ to the inside on the back side of the dishtowel. Baste the opening closed along the folded edge. 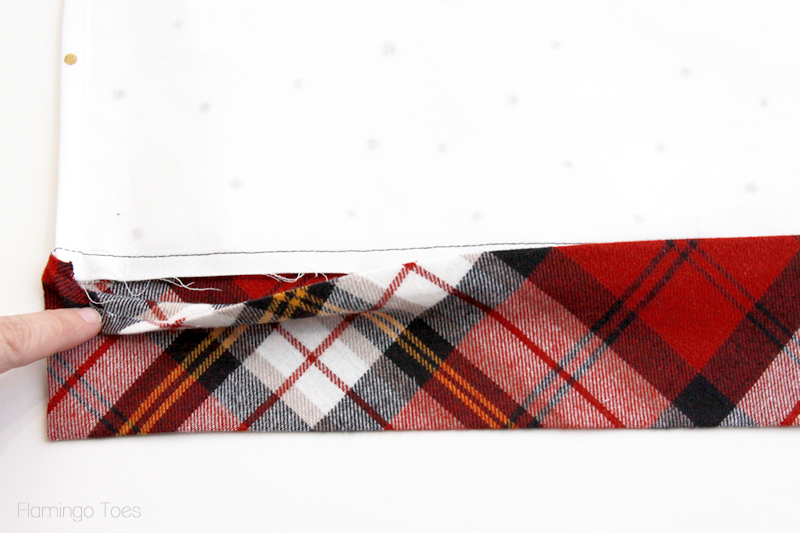 Fold the two long sides of your bias tape trim in towards the center and press. 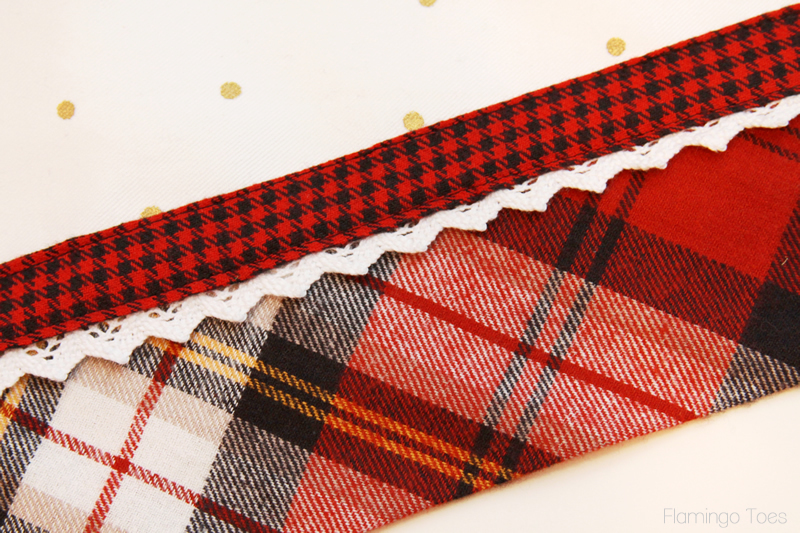 Lay the bias tape so it is centered over the border seam on the front of the dishtowel. Wrap the ends around the sides of the towel. Pin in place, then sew the top down just inside the folded edge. Tuck your lace trim under the open bottom edge of the bias tape. Wrap the ends around to the back of the towel as well. Sew down the bottom edge of the bias tape, sewing the lace in place at the same time. 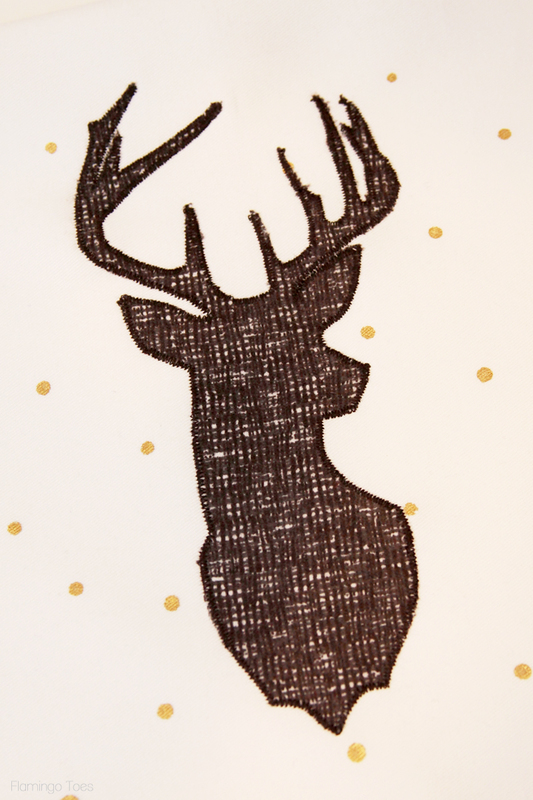 Print out a deer shape (I used this one and resized it to 8″ tall). 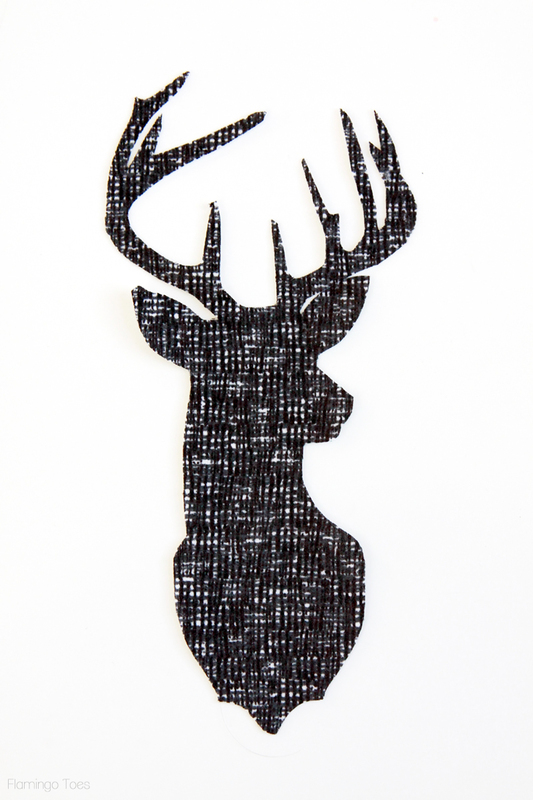 Iron a piece of fusible webbing a little larger than your deer onto the wrong side of your deer fabric. Cut our your deer shape. 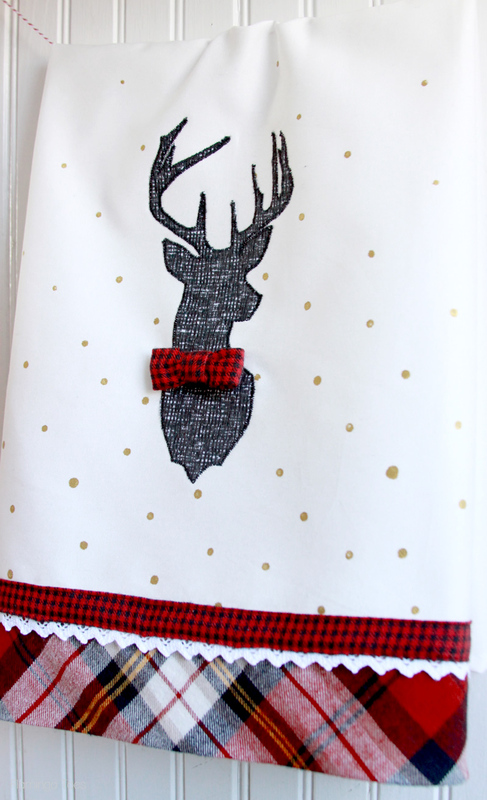 Remove the paper backing and press the deer onto the dish towel. It should be centered and about halfway between the mid point of the dishtowel and the bottom edge. 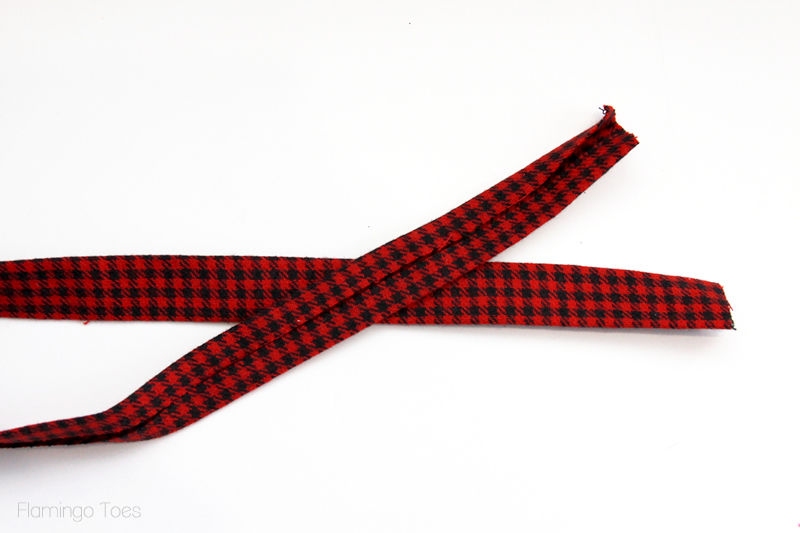 Sew around the edge with a tiny zig zag stitch to hold in place. 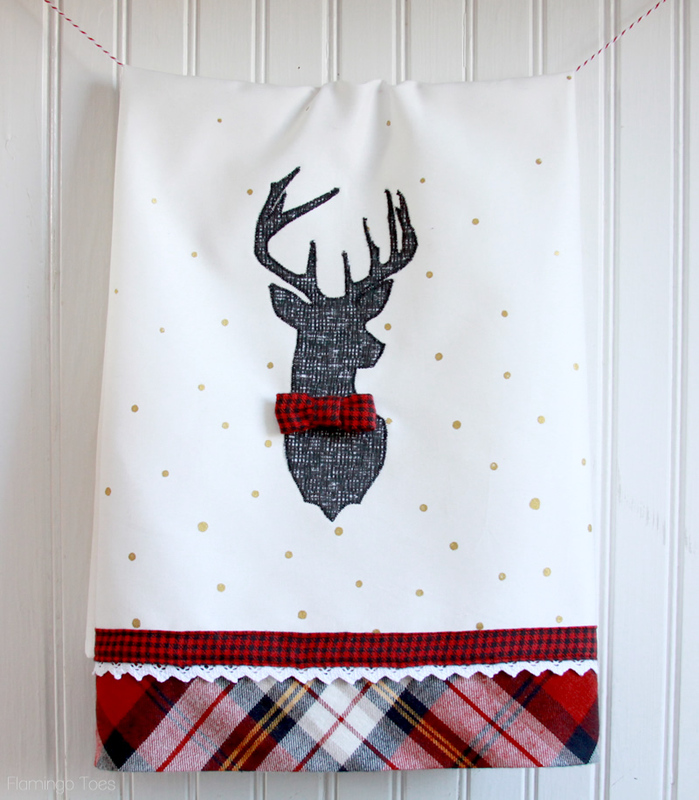 To get your deer all dressed up for Christmas, make a small plaid bow tie and hand sew it in place. So cute!! 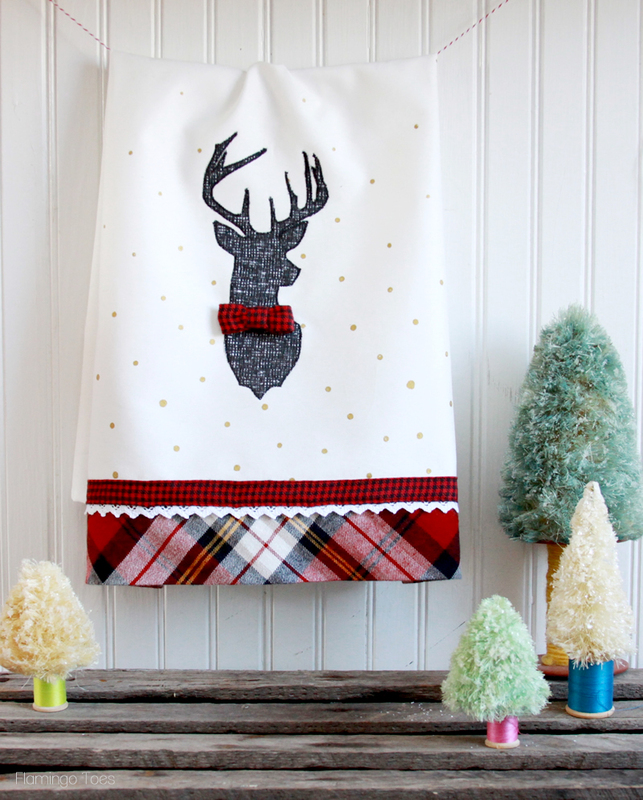 Your dish towel is all finished off and ready for displaying or giving away! I hope you give it a try! The little Faux Bottle Brush trees are fun to make as well – they are super easy to do and so much less expensive than the vintage versions! 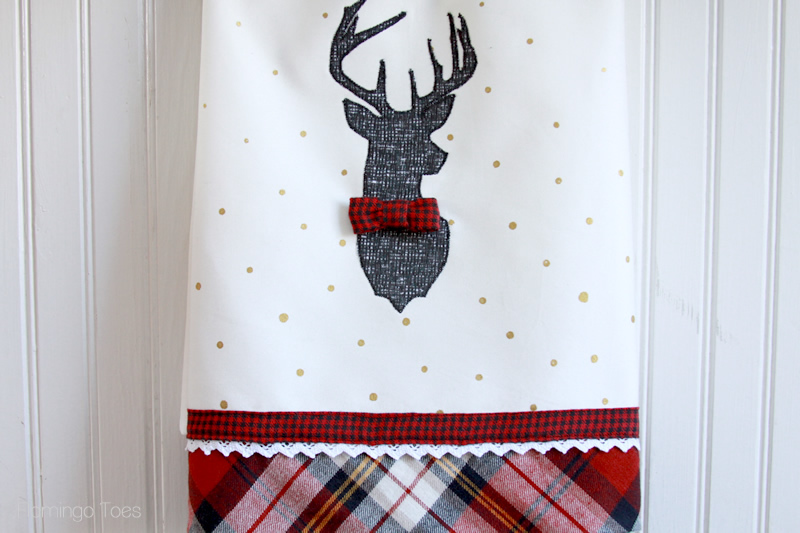 This dishtowel is SO adorable! I love it! LOVE this! It looks like something your’d fine at one of my favorite local shops, “We Took to the Woods”. Thanks for linking up at Snickerdoodle Sunday!! Hi, I just popped over from the ‘weekend wind-up’ link party. I really love this tea-towel, great clear photos. I’m going to put this in my favourites as it would look great in the gift baskets that I make for friends during the holiday season. Wow…you are so creative! I love this and it turned out beautifully! Thanks so much for sharing at Share The Wealth Sunday and I hope you’ll join us for an all new party tonight! This is so cute. Thanks for sharing at the Inspiration Spotlight party. Pinned & shared. See you again soon. Happy Holiday Season. Oh this is too beautiful! I would have to display it out of reach of my family or they might use it. Thanks for sharing on the #HomeMattersParty . I hope you will join us again next week. 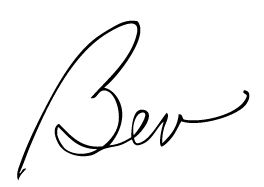 Bev, I love just about everything you make! This is so cute- I love that bowtie! Thanks for linking up to The Handmade Hangout. 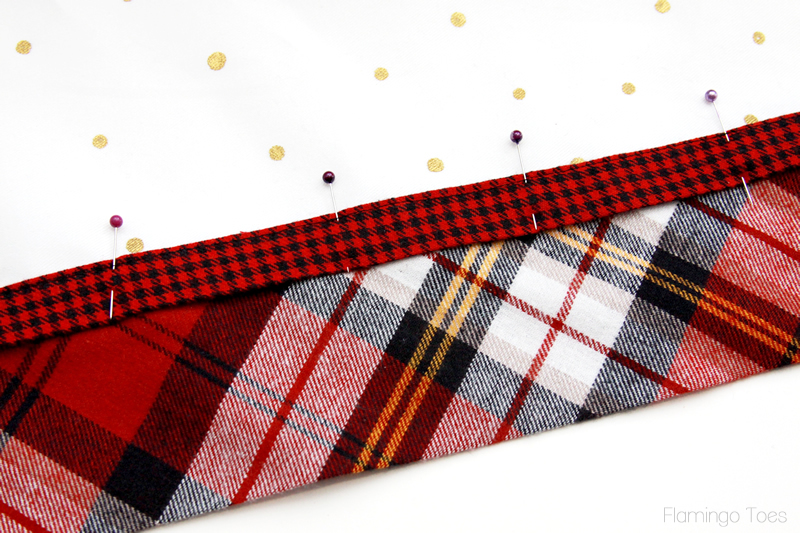 I will be featuring you on my blog when our new linky goes live Thurs at 6pm ET. I hope you’ll stop by and check it out! This is darling! Thanks for the tutorial.